Posters are a great way of advertising your business, or product. A effectively designed poster can do wonders for marketing. Now days most of the marketing is done online, because that is where your customers are. So instead of posting a regular post, wouldn’t you opt for a amazing looking poster promoting your business. Keeping that in mind, we found some nice apps that let you design posters in a matter of seconds in the Windows 10 store. These apps let you create eye-catching posters which can then be posted on your social media accounts. All the apps mentioned are free to download and use. Some additional features might be locked, but they can always be unlocked by upgrading to the paid version if need be. 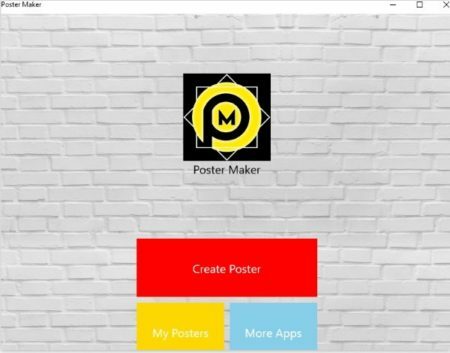 Let’s look at how to make amazing posters with the help of these free Windows 10 poster maker apps below. Poster Maker is a nice, simple app to create posters. When you launch this app it will show you an interface like the one shown in the above screenshot. From this screen select create poster button. You will be taken to the next page where you need to select the poster size. The given sizes from which you can select are (1:1), (16:9), (9:16), (4:3), (3:4), and (2:3). After you select a size it will take you to the next page to select a background, texture, image, gradient, or color. You can select any one of these for your poster. In each category you will find some designs are freely available while others are locked and available in the paid version only. 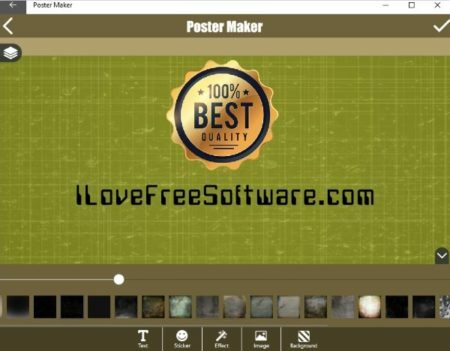 After choosing a background design, you will be taken to the poster making interface, which looks like the screenshot below. In here you can add the text that you need on the poster and also set the position which you want your text at. Apart from that you can also add stickers, effects, etc. Once you are done designing the poster you can click the check mark on the top right corner. This will automatically save the poster on your computer in JPG format. From there you can go ahead and share it with friends or on social media. The app does add a watermark on the poster, but you can always remove it easily using a watermark removal tool. You can even upgrade to the paid version of the app to remove the watermark. 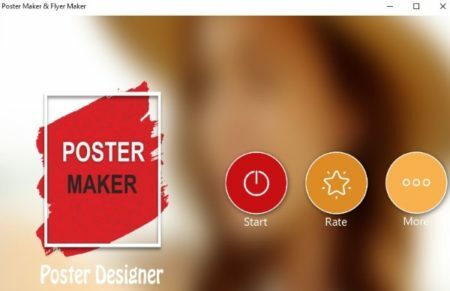 Poster Maker & Flyer Maker is a free app to create posters. 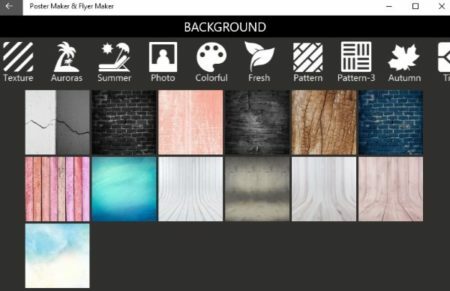 The app is absolutely free including the background designs and textures. As it is free you might see some ads pop up every now and then. But they don’t bother you too much. When you start the app you will see a screen like the one seen in the screenshot above. Click on the start button to start with the designing. First of all you will be asked to choose a background for the poster. This can be seen in the screenshot below. You can see all the background designs in any category are available to be used in your poster. The different categories are mentioned at the top and you can choose from any one of them. After choosing the background design you can crop it a bit. Then you will be taken to the poster designing screen, which can be seen in the screenshot below. On this screen, first of all you can add the text you want. You can choose the font, the font size, and color. After this you can add stickers to your poster if you want. The stickers were not that impressive to add any. Then you can add various effects to your poster as well. Once you are don with the designing, go ahead and click the save check mark icon at the top right corner of the app window. This will save the poster to your computer automatically in JPG format. Also the app does not add any watermark on your poster. These are the two apps that work great when you want to design posters for your business. There were other apps that I found as well but some of them had too many ads which was quite irritating, while some were just to make posters out of your personal photos. None of them offered promotional poster making. So try these two apps out and see how you find them.